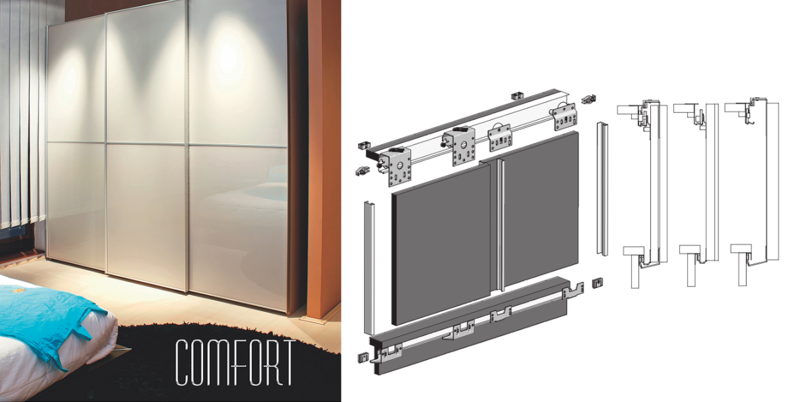 COMFORT is a solution dedicated to the large volume furniture manufacturers as well as smaller producers. System is designed for installation of sliding doors in free standing wardrobes and cabinets, both preassembled or ready to assembly, flat pack furniture. Ball bearing sliding door gear ensures quiet and trouble-free operation. System is completed with high quality anodized top track, and stylish and decorative handles and C-profiles. Maximum door weight is 25kg.